This one below is a birthday gift for my best friend of 17 years, a necklace & earrings set handmade with Swarovski crystals. Nothing out of the ordinary design but it'll stay in fashion for the next few decades... quite confident of that! 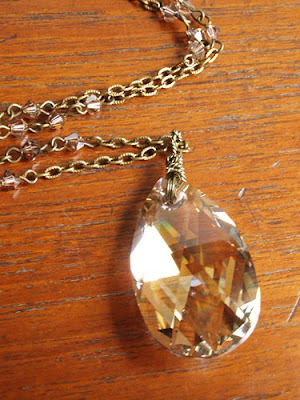 This second necklace was created some time back and was collecting dust on my desk because I was too lazy to mail it. It's for a pen-pal hopefully she doesn't read this post before she receives it. 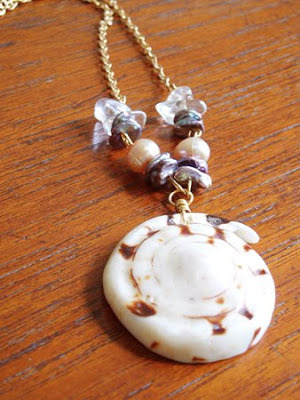 It's made of shells, pearls and quartz. I hope it survives Italian customs! Nothing better than handmade gifts =) I urge you to create your own birthday cards if you want people to keep your mementos! I'm currently doing some illustrations for no reason, my next post will be my latest artworks! Also I am always open for commissions for ACEOs and small sized artwork... just ask! These are so pretty. They will love them I just know it! Ooo love love the first one.